Gnawas abound in Morocco. In Jajouka, the Master Musicians led by Bechir Attar; in Essaouria and by grand design, the Gnawa elders have passed the torch onto Maleem Mahmoud Ghania. 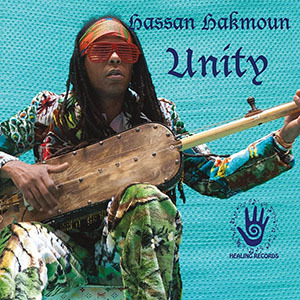 Elsewhere in Morocco the healing force of Gnawa chants and music is in the capable hands of Hassan Hakmoun, a mystic who is made for the present day in a sense as he seems to have crossed a Rubicon of sorts on Unity, a recording he produced with the French wunderkind, guitarist and bassist Yossi Fine. Naturally Mr. Fine’s presence is strongly felt in the production of the recording, but the magic and mystical beauty is all Hassan Hakmoun. The Gnawa musician had already brought his music out of Morocco in a manner in which few have done. He seems to have embraced western forms and made his instrumental content more widely accessible by including bass and guitar of Yossi Fine and the Fula flute of the incomparable and maverick ethnomusicologist and musician Canadian Sylvian Leroux. In fact, recording outside Morocco meant using outside musicians and there are some on Unity from Britain as well. But Hasan Hakmoun directs them with commanding gestures and urges them to play with extraordinary charm and rhythmic accuracy on some of the most difficult passages that they could be asked to sustain. As with all Gnawa music, the intent is to delve into the soul of the audience and facilitate the seeking of the colours that determine the state of mind of each participating listener. There are those who may be troubled and want peace and calm. By playing music that ascends to a certain level of healing the musicians are able to create tonal colours so vivid that those who ask for healing can find in them their elusive peace and make of those colours a mendicant that heals their troubled minds. In the same manner, other members of the audience can find a shade of purple or green that has become their healing colour and the tones of these colours likewise bring peace and tranquility to them that seek this from the Gnawa program. Hasan Hakmoun has long been associated with this kind of healing. 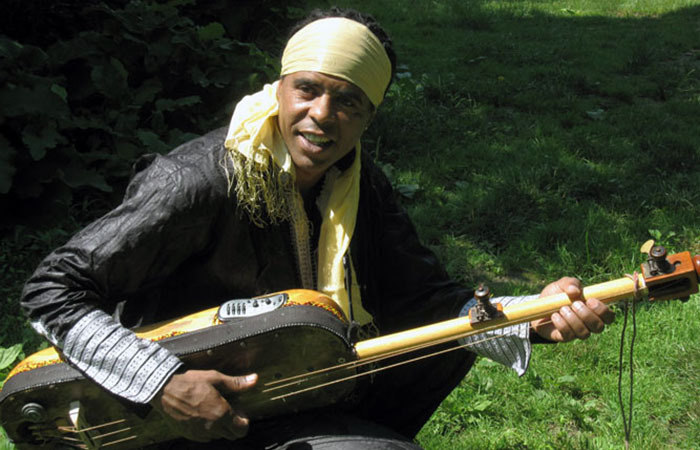 Having toured Britain and Europe and the United States he has brought the Gnawa tradition to a wider audience as have lesser known players such as Said Damir (who also plays on this album) Brahim Fribgane and Amino Belyamani—all Gnawa musicians from Morocco as well. For Unity Hasan Hakmoun has assembled a large cast of musicians and they all feed into his endless energy as he sings the praises of God and the saints, the elders and the places of pilgrimage where the presence of God may be palpable. He urges his people to abandon inhibition and make a transcendent leap into the arms of the spiritual figure and saints who will cleanse them with this music and restore their balance. Hasan Hakmoun does this in “Zidokan” and in the praised of “Moulay Ahmed.” But his best work on the album is the one where he reaches a heightened state of being on “Soutinbi” and on “Amarmoussaoi,” two of the tracks which stay in the memory long after their last notes have died. Although this will always be one of the more popular albums by a Gnawa musician, it is nevertheless a mystical one and will rank with all of the other albums that bring the Gnawa tradition to a wider world. Track List: Zidokan; Balili; Hamadiyi; Dima Dima; Baniyi; Ohio; Boudarbalayi; Soutinbi; Amarmoussaoi; Moulay Ahmed; Balili (Soul K Remix); Ohio (Yossi Fine Remix). Personnel: Hassan Hakmoun: sentir, voice and karkaba; Harvey Wirht: drums; Shaun Kelly: percussion; John Lee: guitar; Sylvian Leroux: Fula flute; Jamshied Sharifi: keyboard; Chicako Iwahori: voice; Said Damir: karkaba and voice; Ahmed Ait Lafquih: voice; Shelly Thomas: voice; Yossi Fine: guitar and bass; John Alvizakis: oud; Jon Paris: harmonica; Konate Primus: sabar drum; Najja Codrington: sabar drum.